I am currently doing a sketching class with Mike Sheehan. It extends over three Saturdays. He also asks us to do a lot of sketching in between, which I am trying to do. 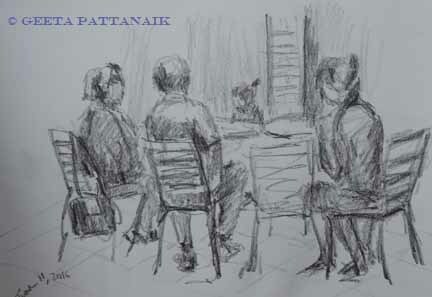 This is a sketch I did of a few people having brunch on a Saturday morning. I am trying to put more people in my paintings and even though it does not come easily to me, unlike drawing landscape, architecture and still life, I am trying to get over that. People move, light changes and it gets hot or cold. Those are the challenges of creating art by first hand observation, not photographs.